Baths, princely mansions, luscious gardens and splendid statuary have been unearthed on the Colle Oppio. Eyewitnesses to these splendours include Pliny, Michelangelo, and the great 19th century archaeologist Rodolfo Lanciani. During this walk, we will be discussing these accounts and more recent findings on the hill during the last 15 years. 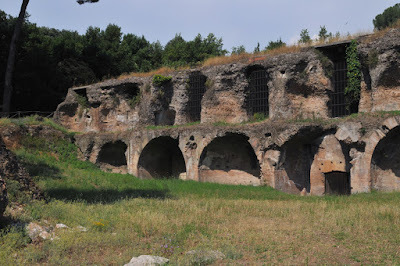 Thanks to a special permit, we will also be visiting the so-called "Sette Sale" (Seven Halls) -- water cisterns from Trajan's Baths. All this and more as we unravel the fascinating history of this hill. When: Sunday, November 27, 2016. Time: 10:30 a.m.; 11:30 admission to Sette Sale archeological site. Meeting point: Colle Oppio area, exact location to be provided to those registered for this walk. Cost: €10 for members and €15 for non-members. There is a supplemental entrance fee of €4 to the Sette Sale. RSVP required by Thu. Nov. 24th, ATTN Joe at canadarome@gmail.com. You are financially responsible for your reservation. NOTE: Please bring correct change.